All competitors must wear shoes and socks at ALL times when competing and/or in the arena. Shoes and socks must match the color scheme of the uniform. In many cases, white shoes and socks should be fine. Competitors must wear solid colored athletic attire consisting of no more than three colors. No patterns such as plaid, stripes or abstract designs will be allowed. Competitors do not need to have their name printed on their clothes but if they choose to do so, it must be done in a professional manner and consist of only their last name on the back of their shirt. 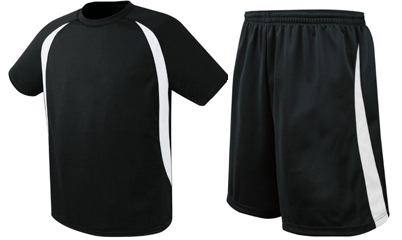 No logos or unapproved advertisement is permitted on the competitor’s attire. No denim, khaki, cargo or any form of casual wear will be permitted. No necklaces, bracelets, watches or other jewelry may be worn. No additional visible clothing may be worn under or over your uniform.